The scrying mirror, or magick mirror, is a powerful psychic tool. It can bring the user hidden knowledge and clairvoyant ability and can act as a portal to other planes of existence. History shows its use in many of the traditional mystery schools and oracular temples. Today the serious student of magickal arts can rediscover the ancient rites of the magick mirror, for these techniques are again coming to light. Scrying can be defined as the mantic art of gazing into or upon a crystal or dark mirror, allowing the physical eyes to relax, thus letting the inner psychic eyes begin to open and receive desired visions or information. 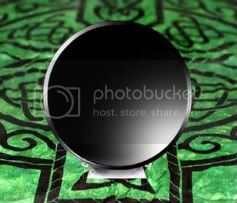 The use of the black mirror is one of the best methods of achieving the state of mind required for entering trance and for scrying work. It not only acts as a focal point for visualization but can become a doorway into the astral plane. It allows communication with higher realms and the subconscious and access to Akashic records. The traditional crystal ball is also a wonderful tool, but it is more for advanced users. The scrying mirror is a more efficient way to begin to learn to scry and journey in other realms. The practiced scryer has the ability to "read" these records and focus on this vast source of timeless knowledge with the aid of the mirror and a strongly directed imagination. Guides from the world of spirit often lead the scryer in astral travel and mental journeying through the black mirror or crystal sphere. Scrying develops one's clairvoyant abilities and is especially helpful in strengthening the third eye. The preparation and construction of the mirror is extremely important. 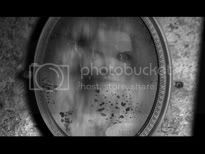 The black scrying mirror must be created with the highest magickal standards and traditions. At the full moon, specially cut glass disks are cleansed and magnetized. They are then anointed with a powerful herbal fluid condenser to attract and hold energy, vital force and any charge given them. A tincture of gold and moonstone is then applied to the surface, and they are ritually blessed under the light of the full moon. They remain for a night and a day within a circle of protection. The black coating is then applied to seal in the energy, and a felt backing is put on to protect the mirror and absorb later applications of fluid condenser. The mirror stand is carved rosewood, ebony or teak. Always keep the surface very clean using alcohol and a soft cloth. Never use it for anything but its intended magickal purpose. Do not let others look into its surface, except in ritual context. Keep it stored in a silk bag when not in use. Frequently recharge the mirror with vital force and fluid condenser, as explained following. Practice the visual exercises described following until mastered. Keep the working area clean and free from any disturbance. Generally, scry using the mirror at night, preferably during the full or new moon, depending on the operation. The mirror can be used at any time, but tends to work better at these points. When indoors, light two votive candles, one on each side of the mirror. Use white or colored candles appropriate to the work: blue for healing, purple for psychic work, orange for communication, and so on. (For more suggestions on candle colors, see any standard table of correspondences, for example in Scott Cunningham's books or The Spiral Dance). 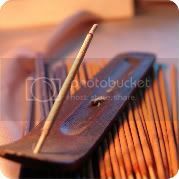 Burn a lunar or psychic blend incense before working with the mirror. Place the mirror on a wooden table or altar with a clean cloth beneath it and be seated on a wooden chair in front of it, or if you prefer, assume a comfortable asana on the floor with the mirror before you. Extinguish all light sources except the candles and/or moonlight. Allow nothing to reflect in the mirror's surface. It should appear as a dark tunnel or window. Before starting, always create a sacred space to work in. Cast a circle of protection or visualize the area surrounded by white light and protection from false or misleading influences - call your guides and guardians to protect the working. Keep a journal to record your experiences. First, clearly decide what you seek or are trying to accomplish in the working and prepare appropriately. Then prepare the work area carefully as suggested previously. Once you are ready, close your eyes and begin to relax; feel every part of your body releasing, relieved of all tension. Visualize your circle of protection and know you are safe and in control of all that happens within it. Begin to breath rhythmically and fully; try a count of four in, hold four, release four, four in, hold four, release four and so on. Feel yourself entering a light trance surrounded by sacred space, removed from time and the material world. Silently call your guides or guardians of the work, invoking the Goddess or calling angelic presences, spirit guides, watchtowers, astral guardians or whatever you prefer. Reaffirm your desire and the purpose of the work. Now open your physical eyes and gaze into the mirror; remain relaxed and do not hesitate to blink when necessary. Relax the focus of your eyes but remain alert. 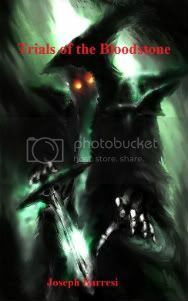 After a while, the surface of the mirror will begin to change and fade; a dark mist will appear. Your inner eyes will now open, and the journey into the mirror begins. Remember that the inner eye sees inside the mind, through the magickal imagination. Most people when scrying do not see the images appear with the physical eyes on the mirror's surface but see within the mirror and in the mind's eye. The mirror acts as a focal point, a gateway within. When you have completed your journey or work you set out to do, begin the return to your body and ordinary senses. Breath fully and deeply, and remain still until you feel you have completely returned. Now close your eyes and remember all you saw and felt during the scrying or journey. Review your entire experience mentally. Write it all down immediately in a journal kept for this purpose. This is a very important exercise to master if you are new to scrying or are having trouble receiving images. It will aid your "visual imagination," which allows your psychic and physical eyes to see clearly together. It gives clairvoyant strength. Sit before your mirror and begin to imagine objects on its surface, one after another. You should try to see these images clearly in the mirror with your eyes open, just as if they were there in reality. Try simple shapes or colors first. Hold onto the image of each shape, object or color one minute before dissolving it and going on to the next. For example, use a red triangle, a yellow square, a blue circle and silver crescent; see them appear in the mirror using your firm imagination. For best results, do this exercise every day for 15 minutes until it is mastered. This exercise is well worth the effort; it gives magickal discipline and strengthens the inner eye so visions can come with clarity and ease. To charge and empower the mirror with light force is a simple but powerful process. It should be done frequently, especially just before using the mirror, so as to ensure you see correct visions, connect with positive energy and do not experience interference. 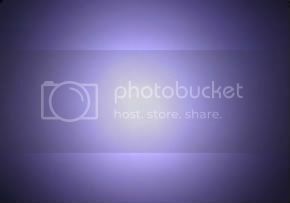 First, you must imagine that white light is collecting inside your body, being channeled down from the crown chakra. The body becomes a vessel filled with light. Remember to breathe fully, deeply and rhythmically. Now stand in front of the mirror and direct the palms of your hands toward one another. Imagine that the internal light is now moving into your hands, forming a ball of condensed white light between them. See and feel this clearly in your imagination. When ready, begin to project this ball of light into the surface of the mirror, purifying and enlivening the mirror, filling it with magickal force. See the light "soak" into the mirror. This process needs to be repeated until the mirror feels "full." This process can also be used to give a special or programmed charge to the mirror. Follow the steps preceding and create the ball of light between your hands, then mentally project your desire into the light before projecting the light into the mirror. This technique can be used for healing works and self-improvement. You can also charge the light with a specific color or vibration - whatever can be felt or imagined can be put into the mirror to aid the magickal energy. The empowering exercise can be used for other magickal operations as well, such as charging other magickal tools and the giving of healing light to another person. All it takes is a strong desire and powerful imagination. Locking the charge into the mirror is accomplished by willpower. When the light has been absorbed into the mirror, state in your mind and with all the faith you can muster that the charge will remain as long as you require it. To release or remove a special charge, simply reverse the procedure, pulling the light out of the mirror into the space between your hands. Then disperse the energy into the atmosphere through the imagination. Do not draw it back into the body - see it return to the universe. A fluid condenser is an infusion of herbs with tinctures, essences and gold added. It serves to hold the mirror's magickal charge and attract elemental force. The condenser can be used not only on mirrors but also on all other ritual tools you want to charge for ceremonial use. The use of certain herbs, stones and metals in small quantities attracts etheric energy of a like kind. These fluids can be made individually to represent each of the elements or to enhance a particular work. I recommend making a universal fluid condenser that will work for all purposes, having all elements represented along with tincture of gold, representing solar and God energy, and essence of moonstone, representing lunar and Goddess energy. The fluid is applied to recharge the mirror and to draw magickal symbols upon it for use in ritual. When the mirror is not in use, it is wise to anoint its surface with the fluid before putting it away. The fluid can be cleaned off with alcohol or distilled water later. To make the fluid, you must first gather the herbs you need. They can be fresh or dried, but the more life force they contain, the better. The list of herbs following includes some suggestions, but you need not use all the herbs to make a good condenser. Use the ones you can find of good quality. Once gathered, the herbs are placed in a pot with distilled water or rainwater. There should be about an ounce of each herb and enough water in the pot to cover the contents completely. Bring this mixture to a boil, and then turn down the flame and let it simmer for an hour with the pot lid on. When this is done, let the mixture cool and strain it through a muslin cloth. Put the liquid back into the pot and simmer without the lid until only a quarter of the original amount is left. When this is cool, add the gold tincture, about 13 drops to each pint of liquid. Then add the essence of moonstone. If gold tincture and essence of moonstone are not available, gold chloride or gold salts can be used and whole moonstones and crystals added to the mixture as a vibrational additive. Gold tincture can also be made at home with fairly good results. To make gold tincture, take a pure piece of gold and holding it with a pair of pliers heat it over a flame until red hot. The red-hot gold is then dunked into a container of about half a quart of distilled water or rainwater. The heat and rapid cooling causes gold molecules to remain in the liquid. This process should be repeated nine times in the same water. Be careful of the rising steam, and try not to get the hot pliers into the water! When you have combined all the fluid condenser ingredients together in a sterilized glass container, then add an equal amount of wood or isopropyl alcohol to act as a preservative. Store the condenser in an air-tight glass container in a dark place, and it will last for years. For a very powerful and personalized condenser, add a few drops of your own blood to the mixture. Quartz crystals can be left in the fluid while it is stored to keep it clear. The best incense to use when working with the mirror or any scrying device is lunar or psychic in nature, representing the sphere of Yesod.